In order to attend this session, it is mandatory to register for the European Development Days (EDD) held 5-6 June in Brussels. Registration closes on 25 May, see more information here. This session will be held Tuesday, 5 June 2018, 16:00-17:30, at Tour & Taxi, Brussels. Gender equality and women’s empowerment is a prerequisite to effective conservation, climate action, and meeting the Sustainable Development Goals (SDGs). 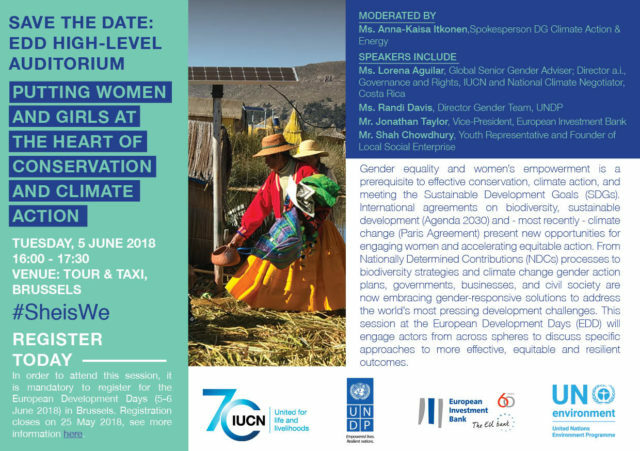 International agreements on biodiversity, sustainable development (Agenda 2030) and – most recently – climate change (Paris Agreement) present new opportunities for engaging women and accelerating equitable action. From Nationally Determined Contributions (NDCs) processes to biodiversity strategies and climate change gender action plans, governments, businesses, and civil society are now embracing gender-responsive solutions to address the world’s most pressing development challenges. This session at the European Development Days (EDD) will engage actors from across spheres to discuss specific approaches to more effective, equitable and resilient outcomes. Please click here to see the save the date.